I originally used 100mm x 50mm rectangular PVC tubing (see View 2). The drawback to this material was the construction of the viewing window. With rectangular tubing you need to cut a hole in the tubing, at a point above the discharge point, and glue in a Perspex window. A club member, Ian Darling, copied my design but used 90mm diameter stormwater fittings taking into account both cost and the range of fittings available. I have found this type of hopper is easy to make and very functional, especially when a non bird keeper is required to feed your birds when you are absent. One of the problems encountered when a non-birdie is required to feed your birds is they miss-identify when there is no edible seed for birds to eat. By this I mean they mistake husk for grain. Many a person has had a neighbour feed their birds whilst they are on holidays and when they come back a lot of the birds are dead because they have starved to death. The hopper I'm about to describe has the advantage of having a viewing window that allows the person feeding the birds to monitor the level of seed remaining in the hopper. I use these hoppers all the time and have had no issues with their operation. Depending upon the length of tube you use, individual hoppers can hold up to a bucket of seed. I use 1m length, 900mm + 100mm, so from a standard 3m pipe length I get 3 pieces. I find they work best when one type of seed is used in each hopper. This allows birds to choose what they want to eat and eliminates wastage. I also find they eliminate seed moths causing blockages with their webs. The materials you will require are listed below. Push on end cap for 90mm stormwater. 90mm diameter stormwater pipe cut to the desired length (I use 900mm). 90O junction F & F (with screw thread). 90mm diameter pipe cut to length (I use 100mm). 90O bend M & F.
Down pipe adapter, either a 100mm x 50mm or 100mm x 75mm rectangle. Shutter door either metal, wood or Perspex. Screw on cap with Perspex insert. 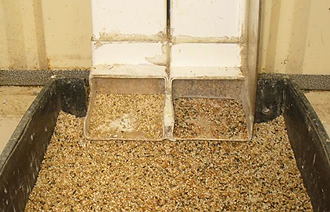 The shutter door (item 7) regulates the flow of seed into the down pipe adapter. I have found the ideal gap under the shutter door is 6mm but this may vary depending upon the seed used. There are two methods to achieve this gap. The "V" shaped pointer (see item 7). 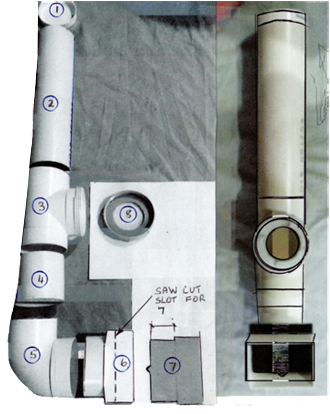 Both methods require a saw cut in the down pipe adaptor depth to suit the shutter door. The screw on cap has to have a hole cut out to accommodate a clear Perspex insert; this is the inspection point. As all the fittings are push tight you do not need to glue them unless water can penetrate the joints. Once you have assembled the hopper it will need a tray under it to catch the seed. The birds feed off this tray by pecking at the seed under the shutter door which then spills onto the tray. Leave a 10mm gap under the down pipe adaptor, hopper base, this allows the seed on the tray to accumalate to a depth of 10mm without hindering the flow of seed from the base of the down pipe adaptor flowing. The last piece of material is a box to collect the waste seed. When the tray is installed leave a gap between the end of the tray and the box so as to allow the husk to fall into the box. This box is then emptied as required.